* Cut the butter into small cubes. Pour the almond flour, psysillium husk and salt in a bowl. Add the butter cubes and crack in the egg. 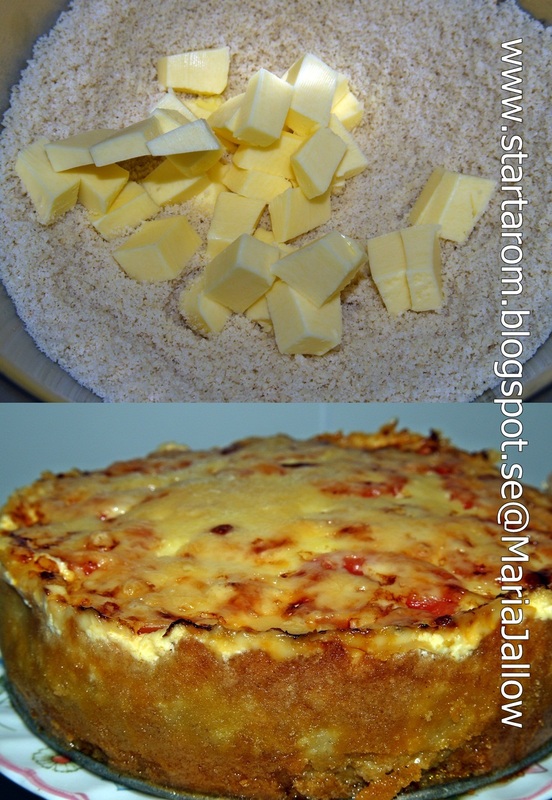 * Mix the dough with electric mixer (you can use a fork or your hands also if you prefer) until the butter is well blended with the rest of the ingredients. Spread the crust-dough to a pie plate. I prefer those with a removable bottom..
* To make the pie crust really smooth, put plastic wrap over the dough and press with your fingers, out the dough over the bottom and up to the edge. Smooth the edge around with your thumb. * Set the crust in the fridge to harden for 30 minutes, so it wont fall down during baking. * Remove foil and pre-bake the shell for 5 minutes at 200 C °. Chop the onion, garlic and cut the peppers into small pieces. Fry quickly in the pan with cumin and chiliflakes. Add the minced meat and fry it together with the ingredients above until browned. Pour taco seasoning, tomato paste and let it simmer for a while to remove most of the liquid. Mix Sour Creme and Philadelphia cheese. Pour over meat mixture into the pie crust and press down pieces of Mozarella in the minced meat. Strike the sour cream - and philadelphiamixture over the meat sauce. 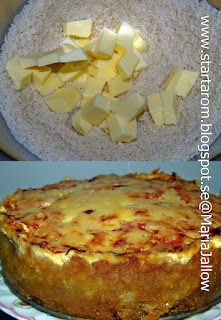 Add sliced ​​tomatoes over and finish with grated cheese. Not too much because then it is closing it and the filling becomes get very "wet". Into the oven at 200 degrees until the cheese is golden. Take half mayonnaise, half of sour cream or yogurt or smetana. Mix avacado and garlic, black pepper, salt, lemon juice and a pinch of curry using a blender of some sort. Mix with mayonnaise and sour cream. Done! You can replace the avakcado with what you like, such as blue cheese, pesto, curry, dill or whatever you think is best suited to what you should eat.